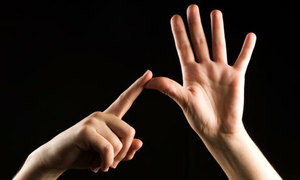 Sign language is a type of language that uses hand movements, facial expressions and body language to communicate. It is used predominantly by the deaf and people who can hear but cannot speak. But it is also used by some hearing people, most often families and relatives of the deaf, and interpreters who enable the deaf and wider communities to communicate with each other. The deaf sign language is surrounded by many myths and misconceptions. Most people who hear think that signing is merely a manual representation of the spoken language which is not true. In fact, the spoken language and the language of the deaf have very little in common. Sign language has the complexity of the spoken language but it is independent from the latter. The best evidence are British Sign Language (BSL) and American Sign Language (ASL) which are unintelligible despite the fact that the hearing people from the United States and Britain perfectly understand each other. Another common misconception about sign language is that it universally intelligible which is of course not true. As mentioned earlier, the sign languages that are used by the deaf in the United States and Britain are very different. The two sign languages share about one third of the signs but a deaf person from Britain and a deaf person from the United States cannot communicate as fluently as hearing people from the two countries. Since sign language is a language of its own, finger spelling or the use of manual alphabet cannot be used as an alternative to signing. It is used in signing but only for words with an non-existent sign or when the sign is not known. In addition, it would take hours to communicate a few minute message through finger spelling. The official language of the deaf in the United Kingdom is British Sign Language (BSL) that was recognised by the Government as a minority language in 2003. BSL is used throughout the United Kingdom including North Ireland although the deaf in the latter also use Irish Sign Language (ISL) which is completely different from BSL. BSL can be learnt throughout the country at local centres for the deaf, community colleges and private organisations, many of which also offer online courses. Entry requirements vary from no prior knowledge required to National Vocation Qualification (NVQ) 6 BSL for those who would like to become BSL/English interpreters. In Scotland, BSL learning and teaching is regulated by the Scottish Qualifications Authority (SQA) which recognises three levels of BSL.